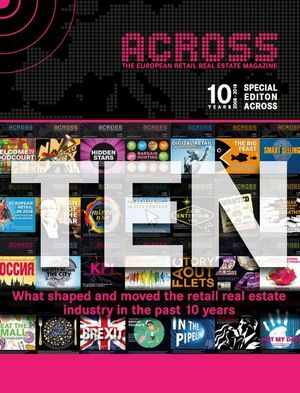 Almost simultaneously with ACROSS, Europe's largest shopping center celebrates a decade of operation. Westfield London reveals how shopping habits have transformed in the British capital over the last 10 years. This October marks 10 years since Westfield London first opened its doors in the capital, pioneering and transforming the shopping, dining, and leisure landscape of the retail industry in the UK. The mall is a 50:50 joint venture between Unibail-Rodamco-Westfield and German Commerz Real, a subsidiary of Commerzbank AG. Over the last decade, Westfield London has become one of the most popular shopping destinations in Europe, welcoming more than 260 million visitors and generating over £9.2 billion in sales. Demonstrating success over the past 10 years: Sales have grown by 52% and footfall has grown by 25%. To mark this milestone, Westfield London reveals how shopping habits and trends have changed since 2008. Statistics show that shoppers are spending more time at Westfield centers than ever before, with the average trip now lasting 98 minutes. While 25-34 year olds remain the largest shopping group by age, second place has shifted from 18-24 year olds to 35-44 year olds over the past decade. Westfield London has established itself as a global tourist destination: Of its 260 million visitors, close to 20% are tourist shoppers. Sales from the number one tourist country, China, have risen 165% since its opening. The average spend for Chinese tourists in 2017 was £442 at Westfield London; however, for the luxury Chinese shopper in The Village, the amount jumped to £979. The number of visitors from the Middle East and North Africa is also continuing to rise. The UAE, Saudi Arabia, and Kuwait are the top three spending Middle Eastern countries at Westfield London. The beauty category is one of the stand-out spending success stories in the capital, with the rise in social media and, more recently, well-being trends playing a role in the staggering 62% increase in spend on health and beauty items. Westfield London saw an impressive £70m spent on beauty in 2017, and the center has grown its health and beauty outlets by 50% since 2008 to keep pace with the ever-growing demands of shoppers. And, as consumers increasingly swap their shopping trips for day trips, visitors are spending 90% more on dining now than they did in 2008. Westfield London has increased the number of food and beverage outlets by 39% over the last 10 years, with a total of 80 dining outlets at the center.